When was the last time that you said man I can't get enough of those brussels sprouts??? Well probably NEVER! I have tried a million different ways to make something out of brussels sprouts and not once did I enjoy a single bite until I came across this gem of a recipe. I could eat this dish all day long but for my digestions sake (in the cabbage family if you know what I mean) I won't go there. I do highly recommend this dish for the Holiday's. The first time we made it was last Thanksgiving and it was a huge hit. This is a simple and quick recipe from Paleo Magazine that will take you about 30 minutes total to make. If you make a huge batch you will have some awesome leftovers...try warming it up in a pan and throw a couple of eggs on top...instant complete breakfast. Enjoy!! Have you ever wondered what to do with the stocks of broccoli? When you buy organic broccoli, nine times out of 10 the stocks are bigger then the florets. I've always just cut off the tops for eating and thrown away the stocks. I didn't think we could eat those parts as I thought it would be gritty and tough but come to find out that you can eat it after all! I thought I would experiment the other day and so I cut off the bad parts and used my peeler to peal off a layer. I then used my cuisinart with the cheese grater attachment to shred it to the perfect slaw consistency. I made this for my family over the holidays and they all loved it so it is blog worthy! If you are on the Paleo challenge you will need to omit the cranberries and replace the agave with 1/8 to 1/4 cup of apple butter. 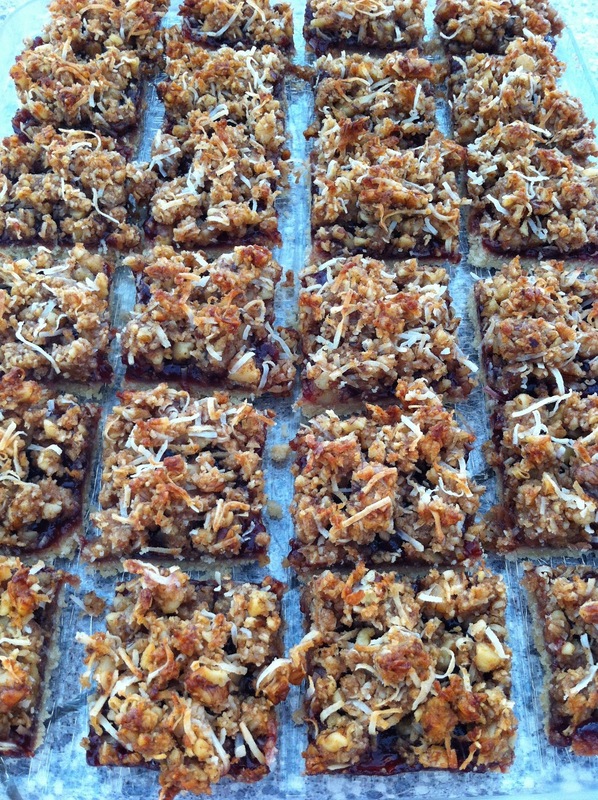 Inspired by Everyday Paleo and requested by the USVI Montessori school! When I was asked to come teach the teenagers how to make a gluten free pizza, I couldn't have been more excited to share how easy it it is to prepare gluten and grain free foods. Kids need to know that eating gluten free is just the first step to cleansing the body of gluten and reducing inflammation. They are on the right track working with Jane to understand how good food can improve your health and wellbeing. 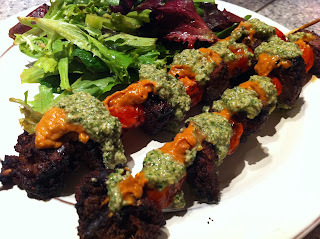 I took this opportunity to introduce a little Paleo into there cuisine vocabulary. It was exciting to see how much they all enjoyed decorating their pizzas and tasting the difference between GF and Paleo crust made with almond flour. Not sure what the final vote was on which they liked better but I know from their immediate response that they sure did enjoy eating them. As I mentioned to the students, cooking is an art so have fun with it and get creative. If you are missing an ingredient look in your kitchen and you'll find something that will work just as good, for instance, if you don't have or like yellow squash maybe you have an eggplant instead or if you don't have fresh rosemary use oregano. This may look like a lot of ingredients and steps but it should only take you about 20 minutes of prep time and 40-45 minutes baking time and it is well worth it!! Have a Pizza making party with all your friends... Tons of fun guaranteed! If you bought a bag of the wild caught tuna from Jess and didn't know what to do with all the extra this is for you! After making some sashimi and seared ahi tuna for three I still had a ton of tuna leftover and I didn't want to freeze it again, so I decided to bake it and make my own "cans" of tuna. I was able to make six 4 oz "cans" of tuna for us to enjoy on salads or eat as a quick snack mix with my yummy paleo mayo. 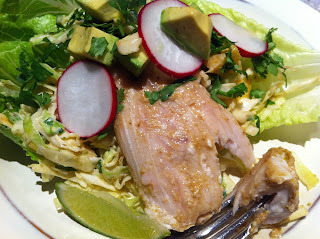 Then I had an idea to use this tuna in Everday Paleo's Tuna Stuffed Eggs. Caitie and I whipped these out to take to the La Luna Happy Hour event... we knew that some of our CrossFitters on the challenge would be there so we brought 3 Paleo challenge friendly appetizers so all of us could enjoy some great food and these little gems were a huge hit!! 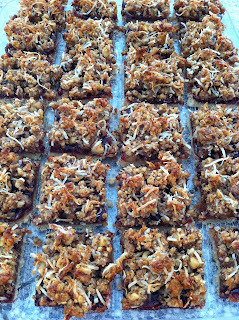 Make a double batch and you are set for parties, picnics, lunch or just when you need a quick snack between meals. Enjoy! If you haven't gotten the fresh catch of the day from Jess Murphy at the gym keep an eye on Facebook... We will post it there when the fish is in. 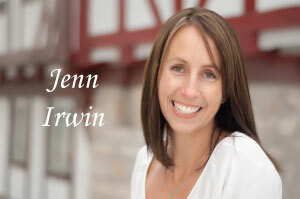 We've had some amazing sashimi grade wild caught tuna and most recently wild caught Mahi Mahi, Thanks Jess! This is a great quick recipe that just melts in your mouth. The only frustrating thing about this is trying to get the coating to stick to the fish... it doesn't exactly coat it nicely so you'll have to place the nut coating on one side then carefully place the fish in the pan and coat the other side. Once it is cooking in the pan it stick nicely. Just be very careful when you flip the fish so it doesn't all fall off. 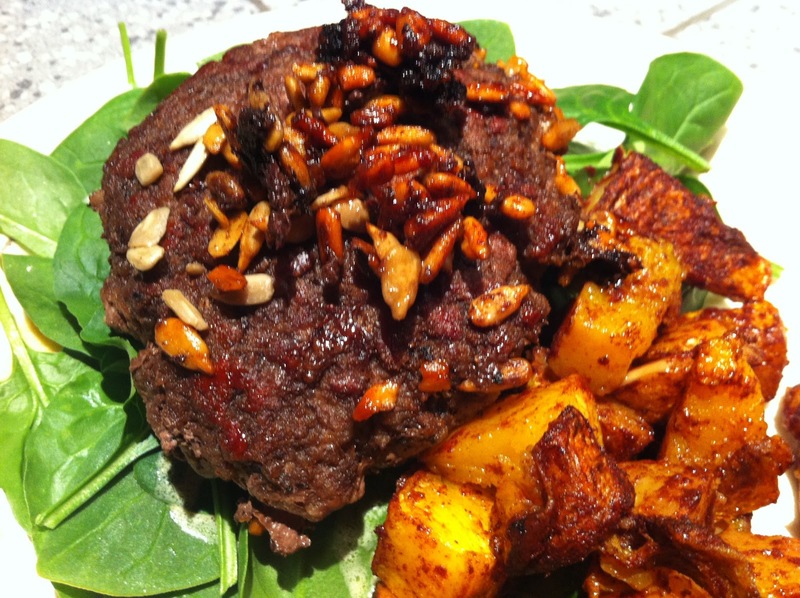 Another great recipe from Paleo Indulgence by Tammy Credicott. In a hurry today? Have too many things on your schedule in the afternoon to be able to find the time to cook a good meal? Well if you haven't started using your crockpot now is the time! I was able to whip the prep work for this meal in under 20 minutes during my little ones nap. Sometimes he only naps for 30 minutes so I've got no choice but to start something that I know I can finish before he wakes. :) If you didn't know what to cook tonight, it's not too late to make this one if you get it in the pot now, it takes 4 to 5 hours to cook on high. This recipe is from PaleOMG... I'm excited to taste the outcome tonight after a long day! Have a great weekend and keep up the great work on Paleo... two weeks in and everyone should be regaining their energy! 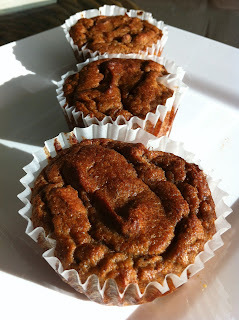 Ok this has got to be the best muffin recipe that I have tasted in a long time however my kids did not agree. I usually don't put chunky nuts in their muffins and I'm guessing that is why they didn't like it. A total texture thing. The only great thing about them not liking it... more for me. :) If you make these and like them please leave me a note in the comments section if you'd like to see these in the grocery store. This is a great recipe for Jessica at Bliss Bakery VI. If you are anything like me the toughest part going Paleo for the first time was giving up my breakfast foods. Gluten free pancakes, waffles, muffins, oatmeal and cereals were my go to foods in the morning religiously. I'm a sucker for cereals. Those first 30 days were rough and I realized that I just needed a little something of the same texture to satisfy my cravings. I tried many other pancake and waffle recipes that were ok but this one is by far the BEST one yet. I used my mini waffle maker and they fluffed up perfectly. For a topping just take some frozen blueberries, heat them up and mash them with a fork and you have a delicious simple blueberry syrup. 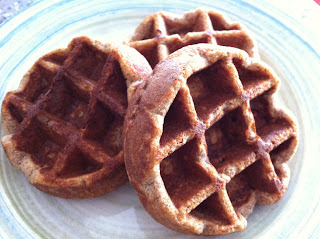 So if this kind of breakfast is a treat for you then treat yourself to this deliciously perfectly Paleo Waffle recipe. 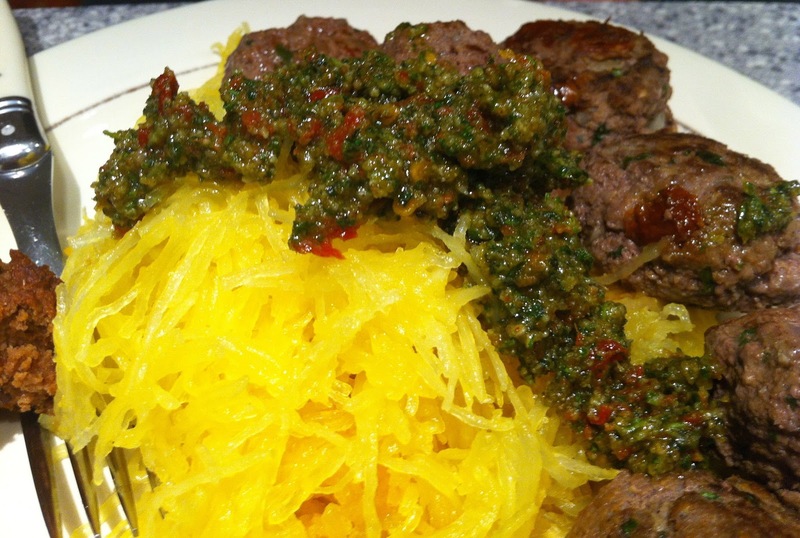 It is quick, easy and you will never know it is Paleo! My 4 year old loves them. This recipe is adapted from The Food Lovers Kitchen. It was a fun filled day for me and the boys... First time for my boys to go out on a Sailboat and they were so excited! If you haven't taken a day trip on the Lady Lynsey, I highly recommend it especially since some of our CrossFitters, Debbie and Gabe work on board and will take great care of you. 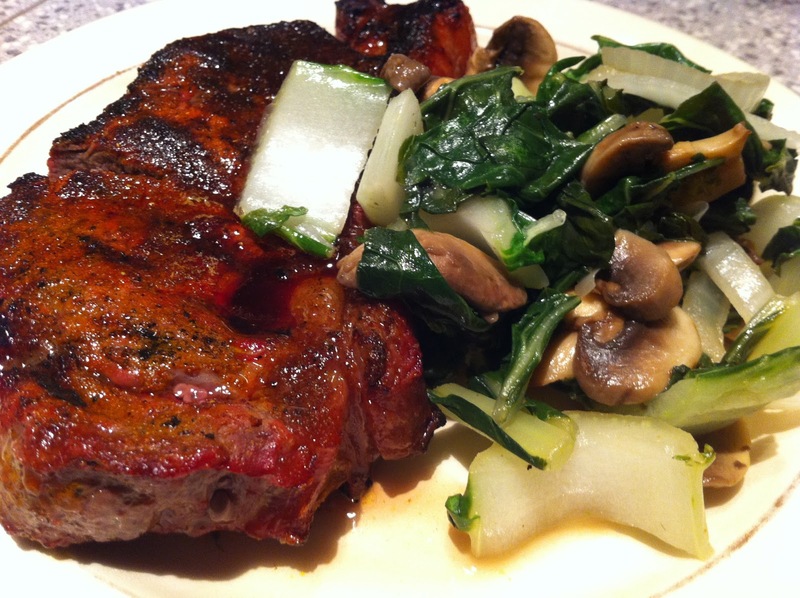 Just beware if you are doing Paleo there is not a whole lot that you can eat. Might want to bring your own piece of meat or some hard boiled eggs to get your protein. Plenty of Veggies and fruit. Debbie brought on her homemade Paleo Mayo in a small jar so she could make her own salad dressing... thank for sharing Deb!! I actually thought my boys were going to do some snorkeling after they geared all up and walked down the ladder to the water on their own. I don't think they actually realized what they were doing until they got to the water that wasn't exactly smooth and decided quickly to come back on board. So, Mom and Auntie got to swim around with the fish insead. Maybe next time for my boys. After a long fun filled day it was time to make my favorite Fish Tacos. And man did this hit the spot! This recipe is adapted from Sarah Fragoso's Everday Paleo Family Cookbook. It's Friday and the end of a long hard week! While my husband and our trainer Conor have been out of town learning great things in the CrossFit world that they will soon share with us, Jared and I have been holding down the fort. It has been a lot of fun getting to see more of you especially our night crew! What a fun group to train with. You guys rock! Great job to all of our challengers for making it through the first week of Paleo and hitting it hard in the gym for all the benchmark WODs. Do not be discourage if you couldn't Rx the WOD or didn't do as well as you wanted... You are being too hard on yourself. It's not Perfection but PROGRESSION, and you are all progressing in amazing ways!! Now take a break and make the most delicious and simple meal ever! It will take you a few minutes to throw this one together while your grill is heating up. Have a great weekend! Day 4 of the Paleo Challenge and I have been looking forward to this meal all week! Unlike me, my sister-in-law has a green thumb and for my birthday she surprised me with an herb garden! We kind of agreed on a trade last year... I told her I would train her in CrossFit and teach her how to eat and maintain a Paleo Lifestyle and in return she would help me with the kids and teach me how to grow things. So far our unofficial agreement as come to life! I'm so blessed to have this time to get to know her better and have her a part of our family! Thank you Caitie for all you have done for us and for yourself in the past two months, you are amazing! This recipe was one that she found on Everday Paleo and since our basil has not grown as much as our cilantro we decided to combine the two into the most delicious pesto. Another great day of Paleo! The best part about doing this challenge is looking forward to dinner time in our house! By planning out your week ahead of time you take off so much stress during the week. You've got a plan and the ingredients, now all you have to do is throw it together. It is especially nice if you have someone to help you cook but I know that is not always the case. Cooking with someone else can be so much fun and not to mention quicker! So teamwork it up in the kitchen and take turns planning a week. 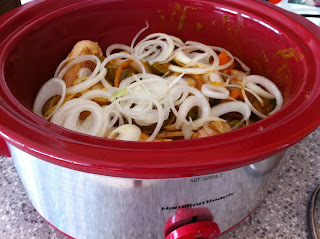 Tonight was a crockpot dish to die for! My sister-in-law planned out this week and so far all her choices have been fantastic. Coming home from work to the delicious aroma of Enchilada Chicken Stew by PaleOMG...OMG is right! This along side a tossed greens salad made for one satisfying meal! Get some good rest tonight and I will see you tomorrow in the Box! Ready for Day 2 of Paleo? Congrats to you all for making it through Day 1, signing up for Paleo, hitting the box for some "Fran" and crushing it today! What a way to kick start the best challenge of your life! If you don't have a partner to help you pick recipes, shop, cook and give support when needed during the next 30 days, look around the gym and I'm sure there is someone around you that is also feeling the need for a little help. This is all about working together, sharing recipes and comiserating about the moods and feeling that you go through as your body finds a new path to health and fitness. And then when you get over the hump you can start celebrating as you make gains in CrossFit and the way you feel, look and perform. 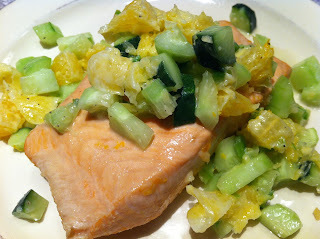 Tonight I had the help of my rockstar sister-in-law, Caitie, who fed and put my 7 month old to bed, played and got my 4 and 5 year old ready for bed and prepared the most awesome Paleo dinner Ginger Citrus Salmon with Cucumber and Orange Salsa. So when I arrived home from the gym all we had to do was cook it up. This dish is amazing and a keeper for sure!! If you have not checked out this Paleo site it is one you should add to your favorites. PaleOMG. But keep in mind just because it is on a Paleo website it doesn't necessarily mean that all of the recipes are approved for the Paleo Challenge. When in doubt don't hesitate to ask the question. It's Sunday night and prep work for the next Paleo Challenge is in full force. Tomorrow is Day 1 of RCFSTT second 30 day challenge. I will do my best to guide you all and provide you with great recipe ideas and quick tips on how to make it through the month. The first week will be the toughest, week two will be better but don't expect to see major changes yet. Be patient and give your body time to make all the adjustments that it needs to make. We are shocking your system and pushing out all that is bad. Make sure you get your measurements in the first week and do not step on the scale or measure yourself again until the 30 days are complete. I've always believed that we should work smarter not harder and with that comes not reinventing the wheel! 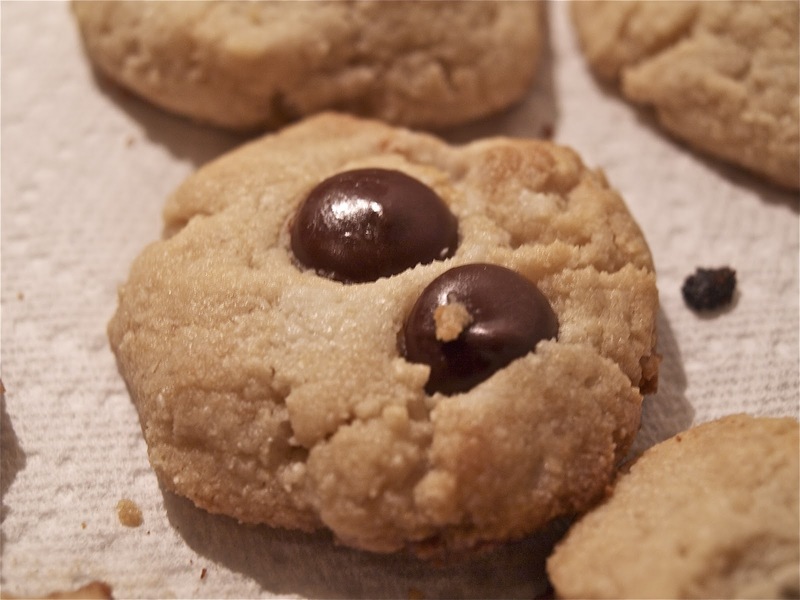 There are so many great recipes out there so use them and you will not be disappointed. 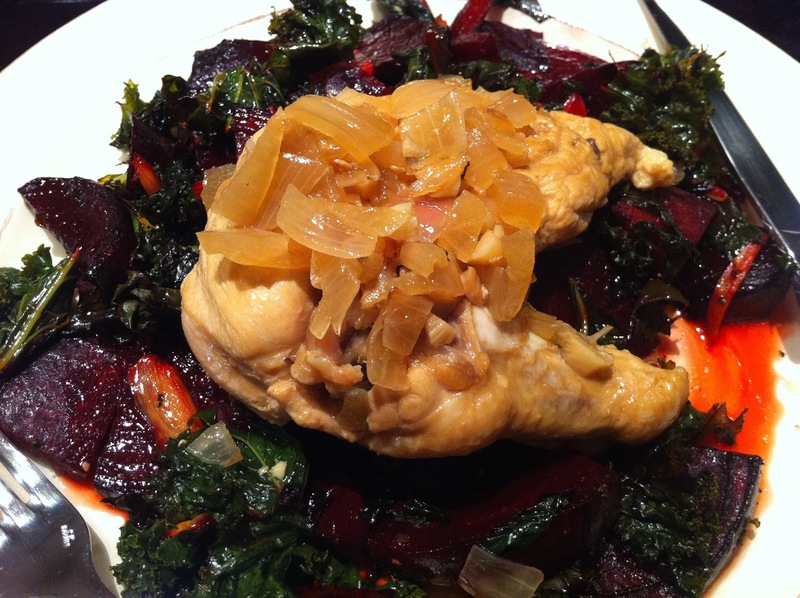 Tonight on the menu is Everyday Paleo's Chicken Adobo and Roasted Greens with beets and garlic! 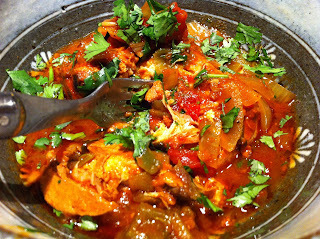 Quick and easy full of flavor dish that is a keeper! Four Thumbs UP!! My 4 and 5 year old both gave me two thumbs up tonight when they had the bedtime snack of graham crackers and milk. I couldn't keep them away from the plate after they scarfed down 3 large crackers. I'm telling you my picky eaters were all over these and all I could do was smile and say "YES"! 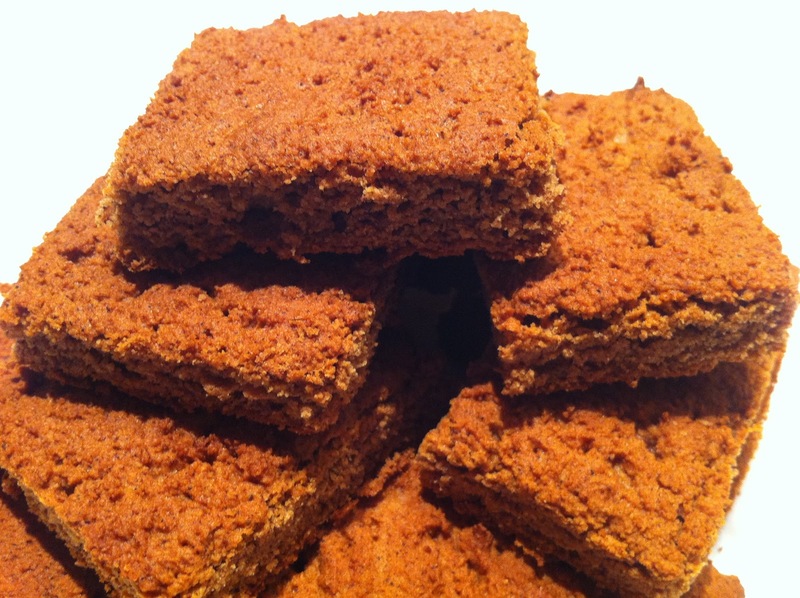 I adapted this recipe from my newest Paleo treats book, Paleo Indulgences by Tammy Credicott.